It is said that every scar tells a story and in India, there has been a rise in acid burn cases due to increased media exposure, hate crimes, and easy availability of caustic acids. Acid burn victims undergo physical, mental, social trauma, often leading to severe anxiety, depression and lowered self-esteem. According to Dr. Niteen Dhepe, any kind of scar — acne, burn, traumatic, and surgical — is improved by laser. Laser scar therapy, particularly fractional ablative laser resurfacing, represents a promising and vastly underused tool in the multidisciplinary treatment of traumatic scars such as burn scars. Appropriate surgery in right time combined with lasers along with psychological support will restore the waning life of acid burn victims. How Exactly Does A Laser Treatment Work For Acid Burn Victims? Despite this refined tool, laser treatment protocols require a skilled hand. Skin City’s combination protocols for acid burn scars include an Optimum usage of ultrapulse SCAAR fx, fractional drug delivery (DERMATRANSPORT) and Enerjet jet volumetric remodeling helps to bring back the fading smiles of acid attack victims. Laser is usually complementary to surgery and can minimize the need for surgery. 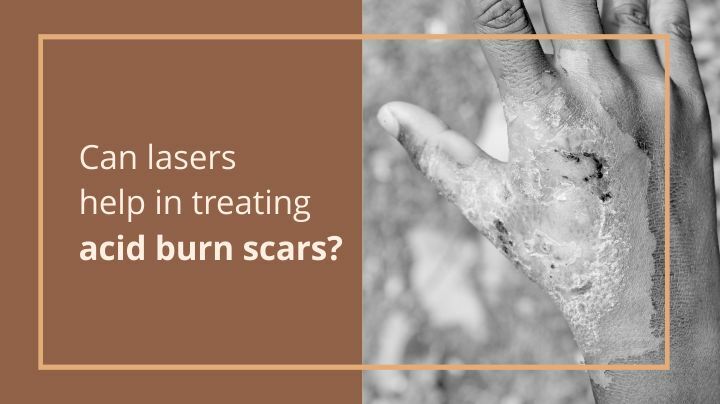 We especially work on a severe burn and traumatic scars and our board-certified dermatologists and plastic surgeons have a solid understanding of laser physics, tissue interactions and scar physiology. Painful scars that restrict motion and have been refractory to conservative management, including topical creams, steroids, dermabrasion and laser, usually will require some type of revision. If you decide laser treatment is for you, you may want to make a few small adjustments to your lifestyle leading up to the procedure. You’ll also need to watch out for sun exposure, as laser treatment works best on skin that’s not sunburned or too tan. It’s a good idea to tell your dermatologist if you’re prone to cold sores, and if you’re taking any vitamins or supplements. Meeting with our dermatologist ahead of time for a consultation will take care of any other loose ends and prepare you with all the information you need to make the decision about moving forward with laser scar removal. To summarize, the use of lasers has quickly been proven to not only work, but to be far less expensive than other treatment options. If you are someone who is struggling with the healing process of a burn scar, this treatment plan should be a consideration. Additionally, the scar may be helped by the topical application of silicone gel products which will protect the wound from bacteria and help fade and flatten the scar.